In order to understand the behaviour of the hydrological cycle, to assess the response of one or more systems to certain inputs and to estimate present and future water availability in the megacity of Lima, climate and hydrological models are needed. 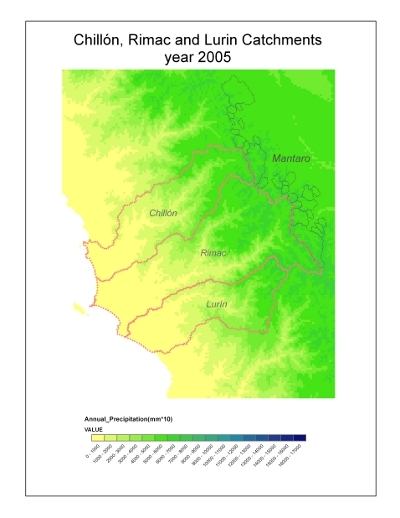 Hydrological models refer to river basin catchments. In the Lima case, the HBV model is been adapted for the local conditions to be applied in the three catchments of the Andes (Chillón, Rímac, Lurín) and in defined sub catchments on the Atlantic side of the Andes (Mantaro). To obtain more water for the more than 8 Million inhabitants of Lima, one option in discussion is the exploration of new water sources from the Atlantic side of the Andes (catchment of the Mantaro River) and deviation to the rivers of the Pacific side. To estimate the potential extra water supply that could be introduced into the water system of Lima, the average rainfall contribution from the three catchments on the Pacific side and from the sub catchments on the Atlantic side were analysed. The projects Marca I and III are already in operation, while Marca IV (Huascacocha) is in the execution phase and Marca II and V are still under deliberation. The yearly rainfall contribution of the Rimac River catchment is 41 per cent (395 mm/a), while all planned Marca-projects would contribute aprox. 23 per cent. For preparing water balance modelling of the catchments and sub catchments, Global Climate Models (GCM) results have been adapted to the project area by transforming the climatological variables such as rainfall and temperature from one spatial scale to another (downscaling). 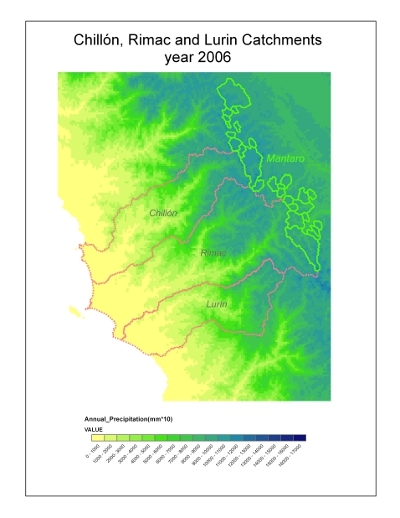 For two different GCM (HadCM3 and ECHAM5) and 3 scenarios (SRES-Scenarios A2, A1B and B1), the percentage of variation in the rainfall for the period 2012 to 2050 with respect to the period 1999 to 2008, as well as the monthly average difference between observed and downscaled rainfall, is analysed. This analysis constitutes the input for the subsequential hydrological modelling. A cooperation agreement with the National Meteorological and Hydrological Institute SENAMHI has been concluded to have access to a wide range of data and exchange software programs and methods. Download Executive Summary of the climate and water balance modelling (Spanish, pdf, 340 KB).